Former electrical engineer Mark Reynolds, 34, graduated from the Foundation Degree in Community Football Coaching and Development in 2016. 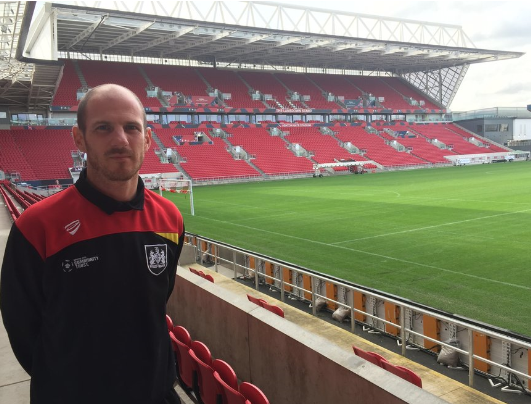 He is now a Community Coach at Bristol City FC, and also the Club’s Foundation Degree Mentor. 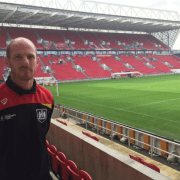 I am a Community Coach at Bristol City FC, delivering sports sessions across Bristol which help enhance the reputation of the club in the community. I am also the Club’s Foundation Degree Mentor. With my experience of the course I can hopefully guide other students successfully through the course. Why did you want to do the Foundation Degree? Before I started the course, I was an electrical engineer for Rolls Royce. I wanted a complete change and hoped that the course would help me start a career in the football industry. I’d played football for many years and thought I would enjoy helping others develop their ability and confidence through coaching. Did the course help you get your current job? Absolutely. The placement I had at the football club as part of the course gave me the opportunity to put the content of the course into practice and also impress the people who would eventually employ me. I have been a fan of the football club since I was young so it’s great to now work here. I did a placement on a Walking Football programme, which is aimed at the over 50s. It was really important to understand a community project as part of the course and this gave me great insight into community needs rather than just youth football coaching. What were the most valuable aspects of the course? I would say being able to use lecture content in a practical environment; it’s great to see the theory work in practice. I learned so much. Although I had some football knowledge, what I learnt about the methodology of coaching was huge. It has made me much more adaptable and understanding of player needs. How was going back to University as a mature student? Being a mature student was interesting – I had to learn to learn again! I really enjoyed it though and adding theoretical knowledge to life experience has been invaluable. Learning online was great, and I found it very beneficial to be able to go over lecture content to check over detail. The teachers were fantastic and their knowledge of coaching is superb as are the facilities at USW Sport Park. I am very open minded about my future, but it certainly lies within the football industry. I think the qualification helps to open doors that can lead to many different paths.